Essential Question: Can we get a richer picture of student achievement and school effectiveness by developing authentic assessment tools similar to those developed by teachers in Nebraska and adding to it the reflective thought and writing provided by a portfolio system? The Massachusetts Department of Education is not currently calling for the assessment and evaluation of work samples, projects and portfolios for all students as the Ed Reform law allows. However, according to Gerald Bracey in his article, “Big Tests—What Ends Do They Serve?” (Bracey The Big Tests.pdf), “The best assessment system, but a difficult one to bring off, begins with teachers rather than with external measures that are imposed on them. The state of Nebraska developed such a system—the School-based Teacher-led Assessment and Reporting System (STARS)—based on instruction-driven measurement as opposed to the dysfunctional, measurement-driven instruction that predominates elsewhere.” In Nebraska the STARS system has generated data that indicates students learn more as a result of this teacher-led initiative. Can we get a richer picture of student achievement and school effectiveness by developing authentic assessment tools similar to those developed by teachers in Nebraska and adding to it the reflective thought and writing provided by a portfolio system? One challenge of such a proposal is how to convert authentic student assessments into numeric data? Look to Wiggins and McTighe’s “Understanding by Design” for a bridge between these information types. In their “Rubric for the Six Facts of Understanding”, they have created a conversion tool. 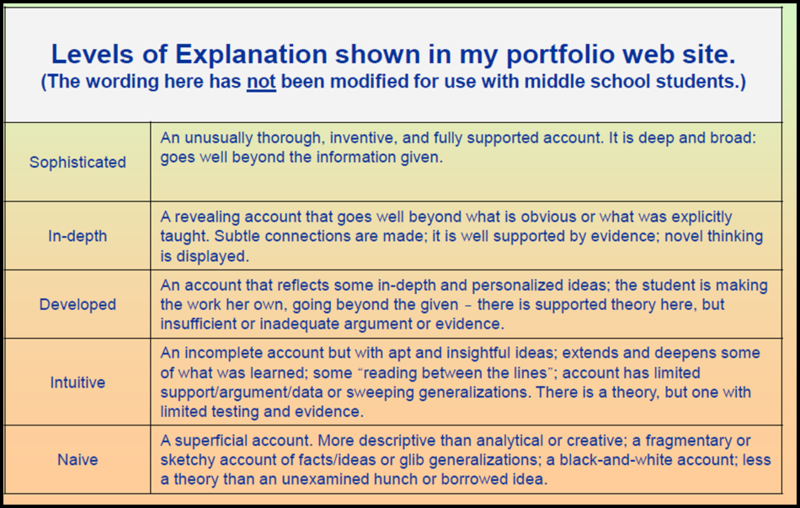 Students and teachers can evaluate student work, classify it under one of the six facets, and then assign that particular work to a location along Wiggins and McTighe’s spectrum of understanding. For example, 7th grade students simplifying math expressions in a video clip are exhibiting the facets of explanation and application. The explanation spectrum goes from sophisticated to naive; the application facet ranges from profound to literal. If teachers can modify these criteria to “kidspeak” and assign point values, then numeric data are created. And, if students’ portfolios exhibit a series of these video assessments, students and teachers can see the progress…the deeper level of understanding that develops as kids learn and grow. This year I plan to develop such a system of portfolio assessment using all of these components: authentic student work in the form of before and after video clips, student self-evaluation using modified forms of Wiggins and McTighe’s rubric for the Six Facets of Understanding, and teacher evaluations using the original Six Facets Rubric. As of today, October 18, 2010, students in my 7th grade Computers classes have done some brushing up on the rules for order of operations in evaluating algebraic expressions. We used puzzles in an Excel spreadsheet to do this. At the completion of these puzzles, students created short videos of themselves evaluating math expressions by hand and explaining their thinking as they went.